UFC 100 certainly lived up to its billing as the biggest event in MMA history. Heavyweight champion Brock Lesnar dominated interim champ Frank Mir to unify the strap, while welterweight king Georges St-Pierre used a great gameplan to nullify the ever-dangerous Thiago Alves. The preliminary bouts of the evening featured a couple of surprises. Mark Coleman defeating a much younger Stephan Bonnar by unanimous decision and CB Dollaway was left unconscious after he was submitted by Tom Lawler in the 1stRound of their tussle. UFC 100’s pay-per-view bouts were definitely worth the $44.95 price tag as we saw a shocking knockout and a couple of stoppages. Ultimate Fighter Season 9 coaches Dan Henderson and Michael Bisping went at it in a “grudge match” so to speak as a much more powerful Henderson knocked the Brit out in the 2ndRound with a crushing right hand. Bisping was out cold on the mat for a few minutes before wobbling to his feet. Brock Lesnar and Georges St-Pierre did what they were supposed to as they easily dispatched of their game, yet overmatched, opponents in Frank Mir and Thiago Alves, respectively. St-Pierre stuck to the same gameplan he has used since his historic upset loss to Matt Serra at UFC 69, opting to dominate on the ground. 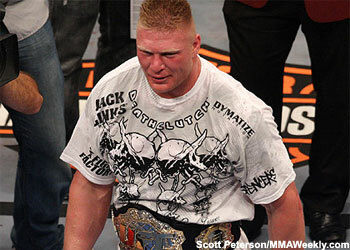 Lesnar used his sheer size to overwhelm former champion Frank Mir. In case you weren’t able to order UFC 100, make sure you check out 5thRound.com’s exclusive Round-by-Round audio coverage of UFC 100 below.